The giant incubation center, Station F, which opened in 2017, hosts over 1,000 startups. 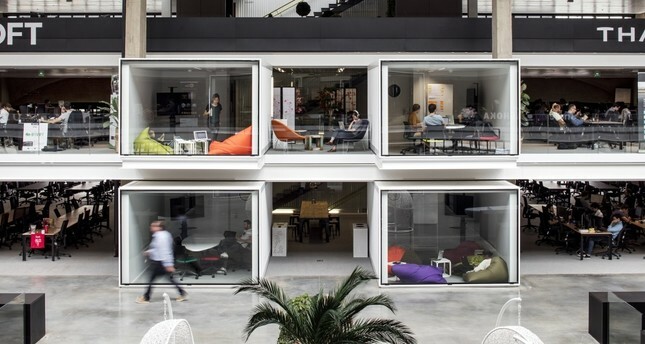 Station F, the largest incubation center in the world that hosts technology startups in Paris, aims to create billion dollar ventures from a former railway station. Opened in June 2017, Station F is home to technology startups by creating a unique co-working space on an area of 34,000 square meters at the former railway station downtown. Perhaps, giant incubation centers such as Station F, which brings together art, design, investors and thousands of people with new ideas, can enable the next billion-dollar venture to emerge from Paris. Some 1,000 different ventures set forth various ideas from artificial intelligence to financial technologies, from blockchain to social projects. ational venture programs, a 370-seat auditorium, eight event spaces and a 1,000-person capacity giant restaurant. During our visit to Station F, we had the opportunity to meet two different startups. Swap, which offers GPS and simple communication devices to families who want to monitor Alzheimer's patients and children, is changing the lives of many people, while Leedbees, a wonderful social startup from Haiti, presents data collected from bees for beekeepers. Kevin Heremoana Besson, the founder of the Leedbees that looks out for bee colonies in a country consisting of hundreds of islands such as Haiti, directs data collected from the hives to their beekeepers. The yellow boxes used for monitoring the beehives on the islands with no people, make activity controls according to the temperature, humidity and the sound of bee colonies; thus, monitoring the production of honey and the health of the bees. The startup, which will collect new data by following the sound of the queen bee in the future, is trying to gain support from investors at Station F.Swap's founder Guillaume Eberwein, who started working on GPS tracking for elderly people with Alzheimer's disease, children and pets, said the fact that his grandfather was an Alzheimer's patient was his main motivation. Swap also has a very small, unshielded voice communication device that allows you to call previously identified people, in addition to its tracking feature. In this SIM-based solution, children and elderly people with Alzheimer's disease can easily reach their families. Smartphones are now able to take photos of objects as distant and dark as the moon and as close as flowers as well as shoot low-light video. Huawei challenges competitors with the introduction of the P30 series, reducing the need for professional cameras. When taking pictures with a smartphone, the distance, low light or close proximity of the object does not pose any problems. Flagship telephones surpass professional camera capabilities a little more every year. In the introduction of the Huawei P30 family, camera capabilities came out the same way. While the Huawei P30 Pro stands out with a screen size of 6.47 inches, the P30 is 6.1-inch wide. The notch on the front, tiny as a teardrop also catches the eye. The Huawei P30 will be sold for 799 euros ($898), while the flagship Huawei P30 Pro, which stands out with its battery life, graphics performance, photo, and video capabilities, will have a price tag of 999 euros. The triple rear camera captures pictures at a 40-megapixel (MP) quality, while wide angle, distance and low light do not pose a problem. The 50X superzoom brings the bird on the roof closer, putting it right in front of you. For example, when photographing a flower, it is possible to get close-ups of up to 2.5 inches. The phone is expected to be available in the first week of April at Türk Telekom and other operators. Türk Telekom prepares a special store experience for the device's sales campaign. The Huawei P30 defies its competitors in the promotion for the P30 family, while the phone's camera was compared live with its peers. Especially low-light, wide-angle, super zoom and close-up capabilities were emphasized. The Huawei P30 Pro is equipped with a 40MP main camera with HUAWEI SuperSpectrum Sensor, 20MP ultra-wide-angle camera, 8MP telephoto camera, HUAWEI Time-of-Flight (TOF) camera, and a new Leica Quad camera system. Even hand-held shots at night are captured in detail, while optically balanced main and telephoto cameras stabilize the image. Huawei super zoom supports high-quality magnification with periscope design. The phone features 5X optical zoom, 10X hybrid zoom, and 50X digital zoom. A prism element in the telephoto camera minimizes camera height, reflecting light at the right angle to maximize focal length without disturbing the design of the device. It forms a blurred background that creates a professional depth of field effect, while not even skipping the curves of the subject's hair. The front 32MP selfie camera contributes to artificial intelligence (AI) and high-resolution photography and video shooting. Huawei AI HDR + provides a combination of multiple photos taken successively to optimize the overexposed and backlit selfies of front and rear cameras. Super Portrait Mode captures even the smallest details, such as hair strands on a person's face. This mode combines depth information, 4-in-1 pixel capturing and custom algorithms to produce exceptional images with an unfocused background and a highly detailed subject. The Hello Tomorrow Global Summit, the world's most comprehensive global deep-tech entrepreneurship summit attended by 4,500 entrepreneurs from 119 countries, brought together leaders of science and technology-based entrepreneurship in Paris for the fifth time this year. RxAll, the worldwide winner of the summit, which also saw the participation of Turkish entrepreneurs selected by Hello Tomorrow Turkey, was the winner of the 100,000-euro prize. Founded by science and technology entrepreneurs, Hello Tomorrow's International Deep-tech Summit, Hello Tomorrow Global Summit, brought scientists and technology enthusiasts from around the world together for the fifth time this year. At the summit organized with the support of Hello Tomorrow's global partner, BNP Paribas, more than 200 CV and CVC (corporate venture capital) investors came together with startups that are gearing up to change the world with science and technology. The winning entrepreneurs selected from 4,500 applications from 119 countries in four categories (energy and environment, health and biotechnology, industry and new materials, data and artificial intelligence) with a Turkey-specific competition also attended the summit, known as the Davos of the complex, deep-tech ecosystem. Commenting on Hello Tomorrow, providing a support fund of up to 3 million euros ($3.37 million) and bringing science and technology entrepreneurs that have achieved their maturity level into the deep-tech ecosystem, Founding Partner and Deputy General Manager Arnaud de la Tour said, "The applications we received this year have shown us that deep-tech innovation is able to emerge from all over the world, and today they can produce deeply rooted solutions to the great challenges experienced by societies." RxAll, which developed a digital platform for testing the quality of medicines with an IoT-based nano scanner and mobile applications, won the grand prize of 100,000 euros. "We aim to contribute to sustainable and fair growth with the products and services we offer to our customers as a financial group that serves internationally in the rapidly changing world conjuncture," BNP Paribas IFS Strategic Initiatives President Andreas Lambropoulos said. "Our strategy is to support entrepreneurs to develop efficient technological solutions. This is where we intersect with Hello Tomorrow's strategy. As BNP Paribas, we are pleased to present this award and contribute to the development of tangible solutions for our future." The results of VMware's new artificial intelligence (AI) research have been announced. Accordingly, 43 percent of respondents do not think artificial intelligence will cause them to lose their jobs, while 35 percent believe artificial intelligence is an opportunity for new career opportunities. An AI survey conducted by VMware, the leading company of private cloud technology, on more than 5,000 users from the U.K., France and Germany in August and September 2018, offers an important study on how artificial intelligence is perceived. Accordingly, 43 percent of respondents do not think they will lose their jobs due to artificial intelligence. In fact, 35 percent of respondents believe this new technology will bring better business opportunities. 53 percent of respondents think technologies such as AI, the Internet of things (IoT), and blockchain provide a more intense and deeper relationship with companies. Similarly, 50 percent of respondents believe technology can help solve environmental problems and climate change. Despite some uncertainties, the research findings still show a positive picture. Around 50 percent of users do not know exactly what lies behind the latest technologies they use. While 69 percent do not know who actually has access to their personal data. On the other hand, 58 percent of the respondents suspect that companies are monitoring or recording activities on their devices. Breakthrough technologies such as AI, IoT, and blockchain affect everything from retail to travel and to personal finance. In this context, the survey clearly demonstrates what users are prepared to accept or not to accept. For example, 65 percent of respondents are positive about using technology to get information and advise about a product in a store, while 69 percent are willing to take advantage of technology to see the flow of traffic to proactively manage the road situation when going home or to work. Some 23 percent of users, on the other hand, find it appropriate for businesses to try new technologies to improve customer service. However, when it comes to the control of their financial transactions, only 7 percent of respondents are willing to transfer control of their money to AI, even if they will accumulate faster money. Similarly, 65 percent of respondents fear or worry that their banks will have access to data on their daily lives, such as spending habits, eating, travel and transportation, even if their money will be better managed. Uncertainty is also a factor in the hesitant approach towards technologies such as artificial intelligence. Around 45 percent of participants think AI is a robot rather than a super-cognitive brainpower to create service and experience. Some 50 percent of the participants do not have sufficient knowledge of technologies such as AI, IoT, and blockchain. However, 64 percent of respondents think companies and government are not clear enough about the technologies they use and how to use them. Similarly, 53 percent of respondents expect institutions to help them understand these technologies better.